a penetrating look into ordinary families living in un-ordinary times. This is the fourth time I’ve seen this film and I still get so moved by it. I still tear up. such a wonderful tribute to the families of our military. Watching your wonderful documentary that is full of soul I had tears and mascara streaming down my face. But in the end, I felt a sense of lightness and hope. The film pulled on my heartstrings as a mother and fellow human. Great, great movie. It helps me, someone who knows no one in the military, understand. While Time Stands Still greatly impacted me. And, it is what our country must see. While Time Stands Still is eye-opening. It drove home the point that there is more we can do to support military families. It’s a fantastic movie. I think it should be a mandatory movie for people to see. It hits you in the heart. It gets down personal. It’s just a good movie, good movie. I really, really liked it. I was so blown away by this movie. There were so many things I didn’t know and I didn’t really expect to be moved the way that I was. It was really a compelling and important experience for me. I am so grateful that I got to see it. I’m going to send a copy of this film to my relatives, who will so benefit from this. there’s a way through it. That there’s hope. YES! I want to BUY the DVD NOW! This is a very personal documentary. When my fiancé deployed to Iraq, I lived through the challenges of having a loved one in a combat zone. I felt something needed to be done to advocate for the millions of families coping with the effects of war. 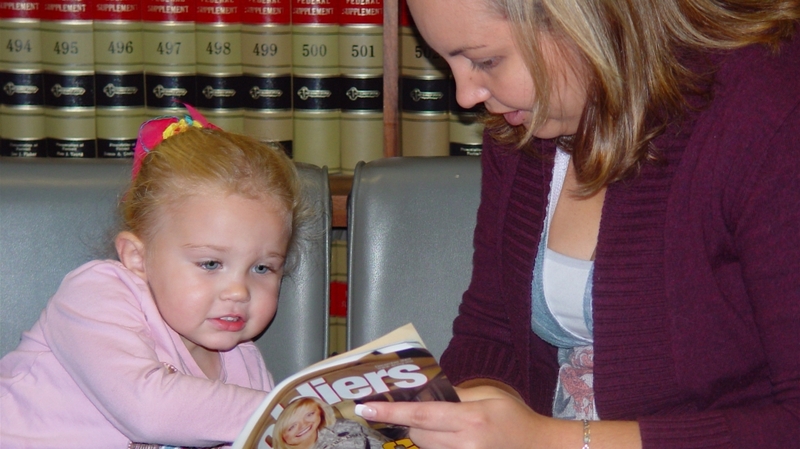 It’s time for the courageous story of Military Families to be heard. 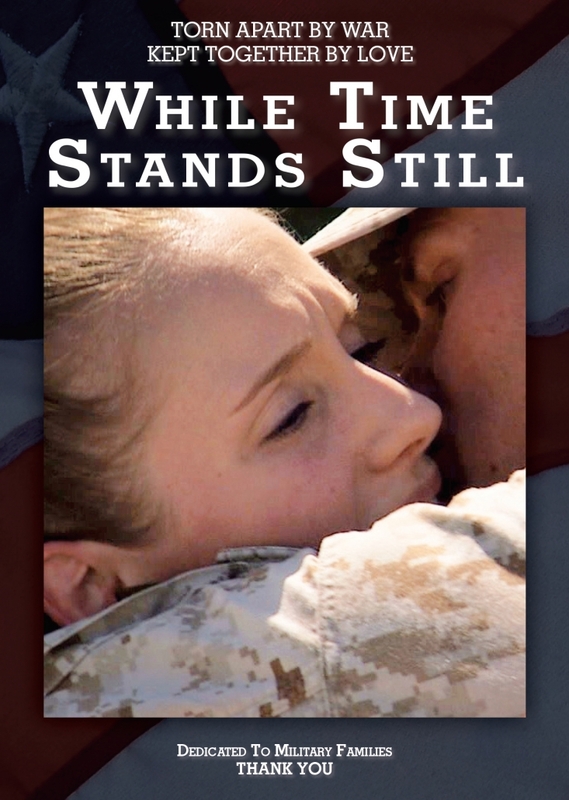 An inspiring documentary about love, courage, and sacrifice, While Time Stands Still tells the gripping story of American Military Families during war, and what it takes to put the pieces back together afterwards. If you have ever wondered how others make it through Deployment, tried to explain to your Spouse what it’s like to hold down the fort, or felt your neighbors don’t understand what having a child in a war zone really means, the documentary While Time Stands Still is for you. 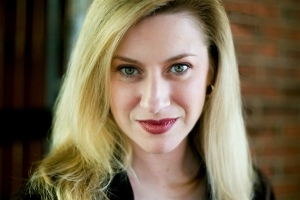 This must-see film by Spouse of an Iraq War Veteran Elena Miliaresis brings our story to light. Get your copy today. Filmmaker Elena Miliaresis shares her own experience as she follows two wives. As these young women navigate the challenges that come their way, they not only find the strength to survive, but also discover their own self-worth. 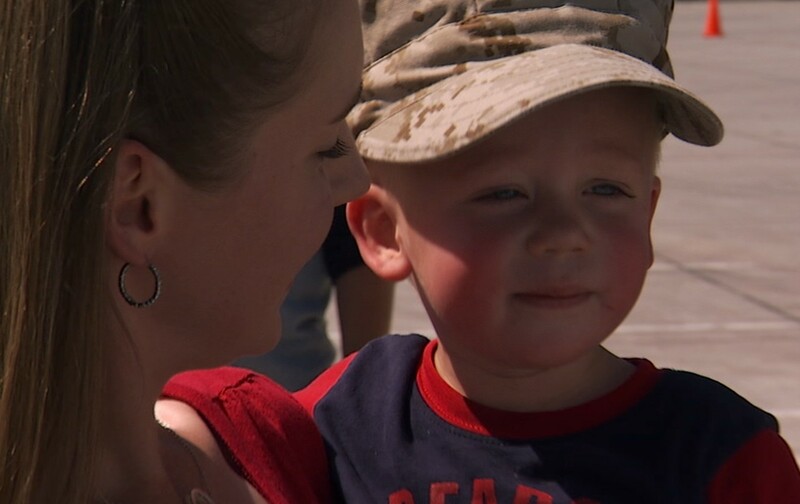 Five years in the making, with over a hundred interviews from Air Force, Army, Marine Corps, Navy, National Guard, Reserve and Veteran Families this riveting film is the journey to healing of America’s brave Military Families. YES!! I want to BUY the DVD! Get the latest news about While Time Stands Still. Include your zip code, so we can bring this inspiring film to a theater near you. I can’t wait to OWN the DVD! Over 2.7 million troops have been deployed to Iraq and Afghanistan. Over 2.7 million families affected. What happens to these families while their loved ones are at war? What is the healing process like when they come back? Often, the face of courage hides the heartache. The wars in Iraq and Afghanistan have been hard on military marriages, with the risk of divorce rising directly in relation to the length of time enlisted service members have been deployed to combat zones, according to a 2013 RAND Corporation study. 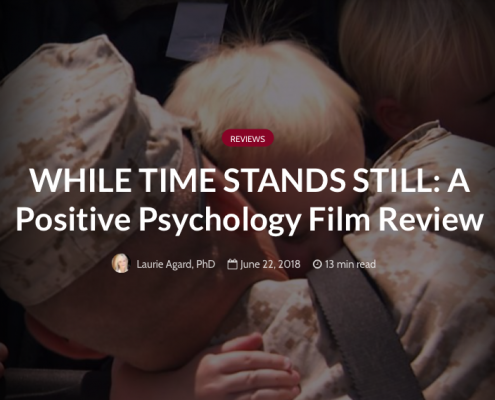 The Journal of the American Medical Association found that among families of enlisted soldiers in the US Army with substantiated reports of child maltreatment, rates of maltreatment are 42% greater when the soldiers are on combat-related deployments. A study in the New England Journal of Medicine found that when compared with wives of military personnel who were not deployed, women whose husbands were deployed received more diagnoses of depressive disorders, sleep disorders, anxiety, and acute stress reaction and adjustment disorders. Spouses whose husbands deployed showed a more than a two-fold increased risk for preterm delivery, the second leading cause of neonatal mortality in the U.S., compared to the non-deployed (8.9% versus 21.4%). The risk of postpartum depression is double (8.1% vs. 16.2%) in spouses with deployed husbands; therefore, monitoring, assessment, and treatment may be warranted. 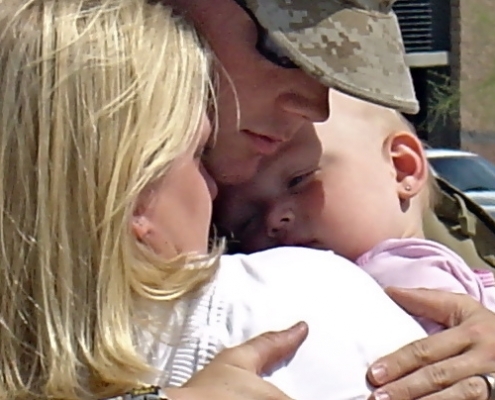 Secondary Post Traumatic Stress (PTS) is being recognized in family members. The number of suicides and attempted suicides by wives and family members is growing. The current resources are not enough. 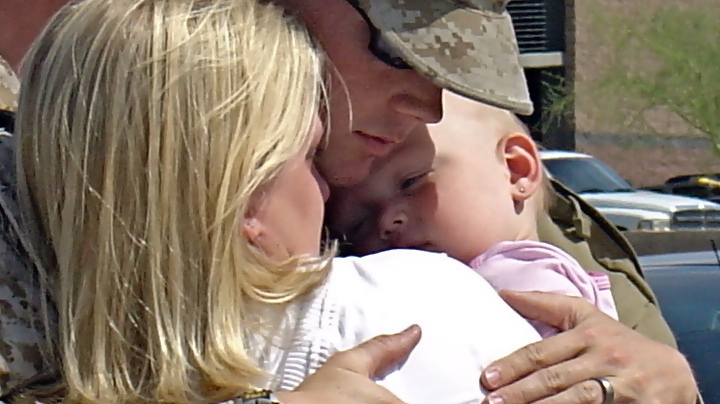 Both the Journal of the American Medical Association and the National Military Family Association have found that new programs are needed to better address the trauma on the home front. I want to see this INSPIRING film & BUY the DVD!